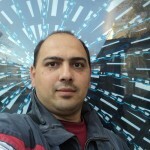 A man from Rhodes, Greece has assembled the biggest jigsaw puzzle in the world. 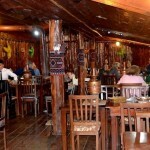 It is over five metres wide, two metres tall and consists of astonishing 32.000 pieces. Another man, from Thessaloniki, has very little space on the walls of his apartment to hang assembled and framed new puzzles. The walls are filled from top to bottom, so soon he might have to hang them from the ceiling. And a man from Bursa has covered his walls with dozens of puzzles both small and large. 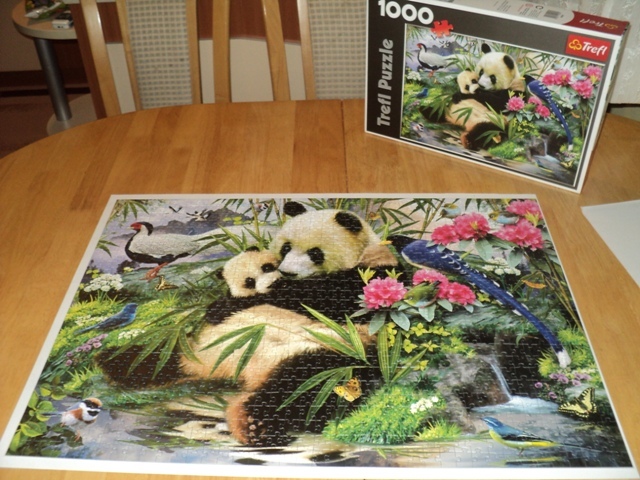 Assembling puzzles is a popular hobby in this part of the world which is evident in the internet forums or Facebook groups where puzzle enthusiasts gather, and there you can always find many people from the Balkans. This interest is understandable, considering the fact that we come from a place where the ancient people made huge stone mosaics thousands of years ago. The tradition continues to this day using cardboard instead of stone though, and doing it in an incomparably easier way, still with the same feeling of excitement and pleasure in creating something great from thousands of tiny pieces. Many people think they could never assemble a puzzle. It may not be easy, but certainly not impossible. 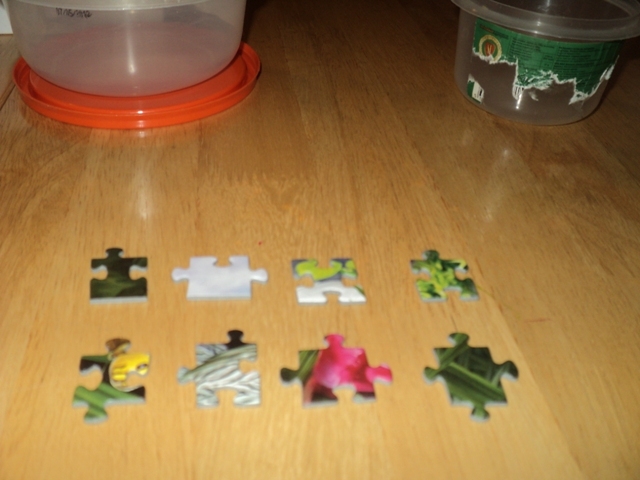 Here are some basic tips on how to make your first puzzle. First of all, you have to choose the size and illustration. 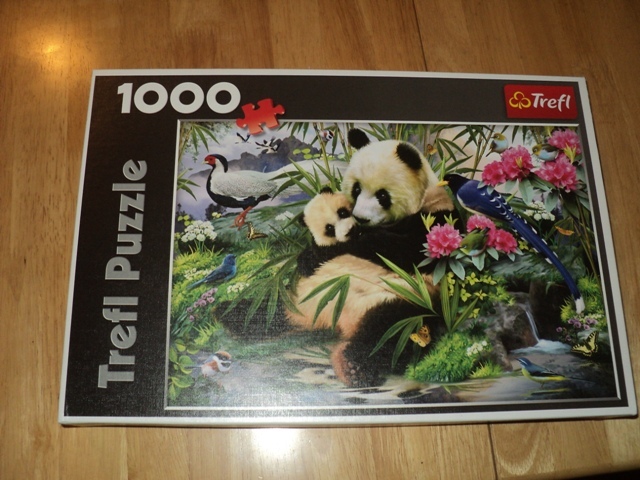 Puzzles consisting of 1000 pieces are accepted as a kind of standard, big enough not to be boring and small enough not be grueling. You can start with 500 or 1500 pieces, with other sizes you would probably make a mistake. Also, it is better to choose a colorful illustration with no overlapping or blending colours so you can easily see where each piece belongs. The first step is selection. 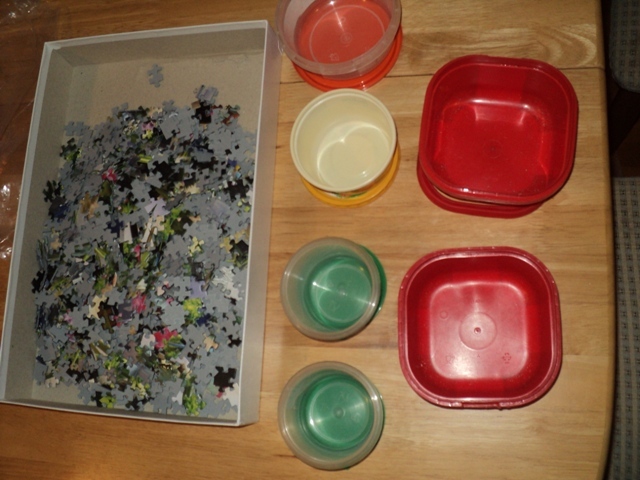 Take a few empty plastic containers or boxes to divide the pieces. The pieces come in several shapes. There are those with a flat side which means that they come at the edge of the frame. Others have a combination of gaps and protrusions attaching to each other as “key” and “lock”. There are pieces with four “locks”, three “locks” and a “key”, with two “locks” and “keys” on the opposite sides (these are the most numerous) followed by two “locks” and “keys” set next to each other, with three “keys” and a “lock” and four “keys”. They can be turned to either side, horizontally or vertically. In better quality puzzles, each “lock” fits only one “key” so it is impossible to mistakenly connect two pieces that do not match. It is sometimes better to divide the pieces according to shape, but more often they are divided by color which tells where they probably belong. 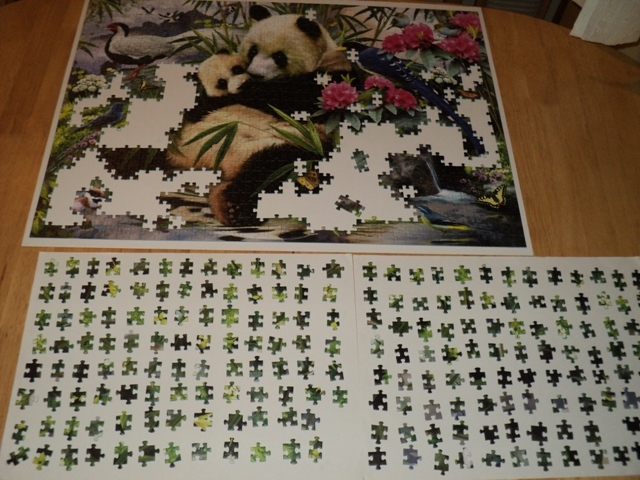 We divided these into five groups: pieces from the edge of the frame (with shape as criterion), birds and flowers, panda parts, green surroundings and surroundings that are not green. If you can not determine where a piece belongs, put it anywhere. Then, if you find a similar one, put it in the same place. 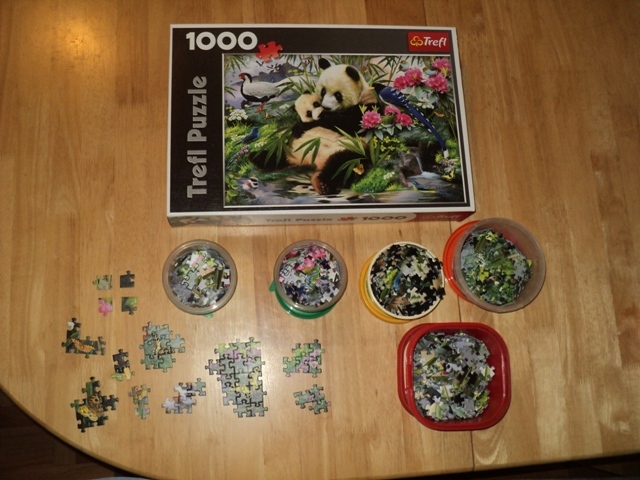 Those that belong to two groups (for example they are green and have a part of the panda) need a separate box. Or put them together with a smaller pile. If you find matching pieces during selection put them together and leave them aside. Separate the corners especially those with two flat sides. 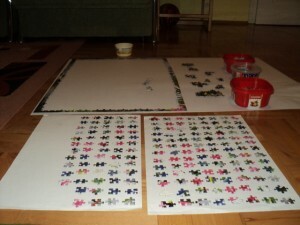 They will be the starting pieces. 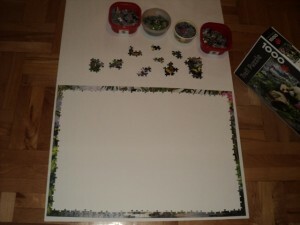 Make the frame from a larger cardboard piece or other material and finally, start assembling it. 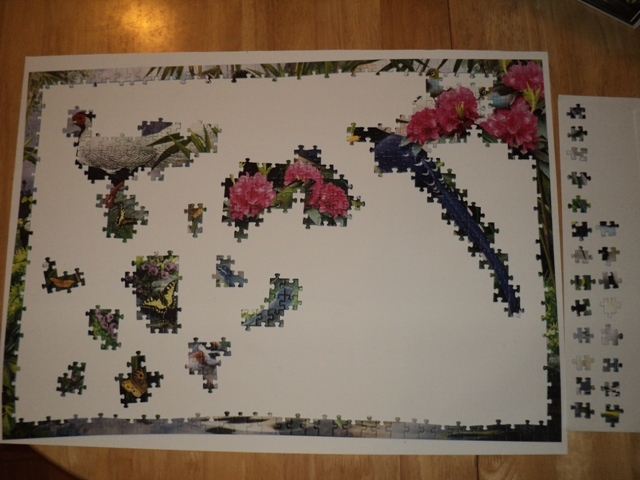 Decide which group to start with, birds and flowers for example and arrange the pieces in line to be able to see them better. Tricks of the trade end here. Everything comes down to finding matching pieces. You don’t have to go in some particular order. Every two matching pieces bring you a step closer to your goal because larger parts make it easier to see the big picture. Do not expect to find the right place for all the pieces in the box. When their number drops, open the next box and add new pieces. 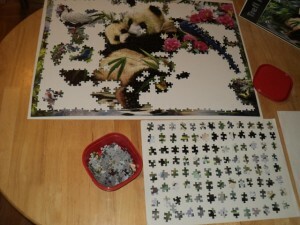 We will continue with the panda pieces. When their number drops and your work slows down, simply move on to the next one. 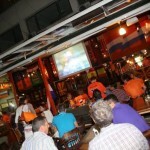 The next group will be non-green surroundings. As you open new boxes you will begin finding the pieces that you previously needed and start filling the gaps. Everything will be easier once you remove the last set of pieces and you will know that whichever piece you need you can find it on the table. It is very likely that at some point, late in the night, you will assemble the whole picture. Next step – try to stop at just one puzzle. 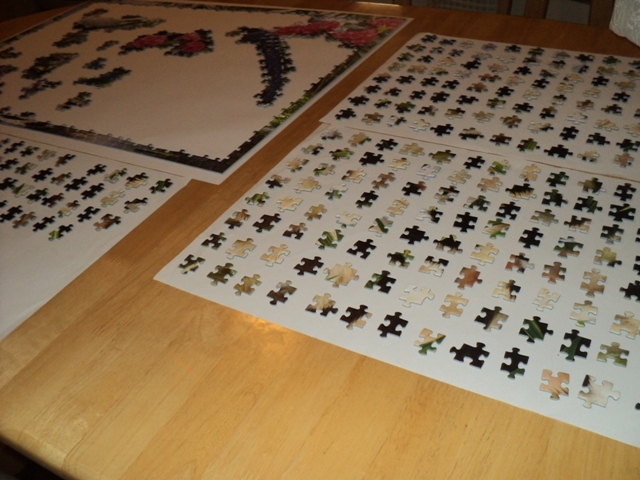 A difficult task as puzzles can be really addictive. 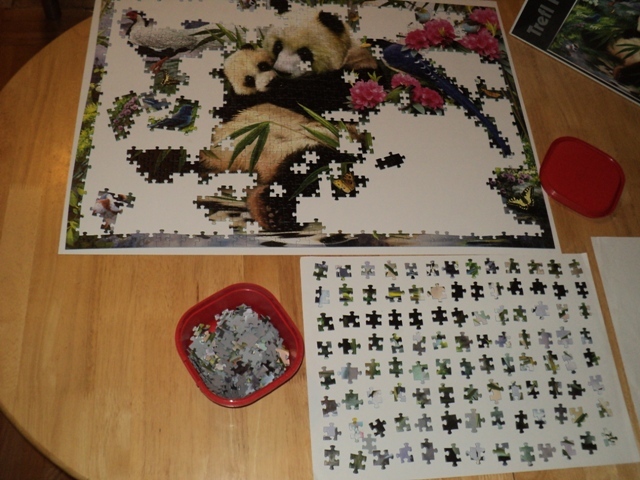 You should take up a bigger challenge which does not necessarily mean a puzzle with more pieces. You can try an illustration with blending colors which makes most of the tricks used to facilitate the work, useless. Fun facts! 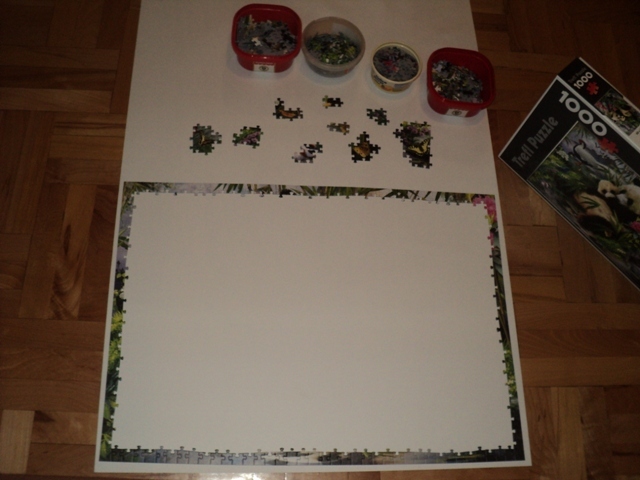 According to the Alzheimer Society of Canada and many other experts, assembling puzzles is one of the best ways to prevent development of Alzheimer’s disease because it improves short-term memory, creates balance and synergy between the left and right side of the brain and stimulates secretion of dopamine which improves concentration and motivation. 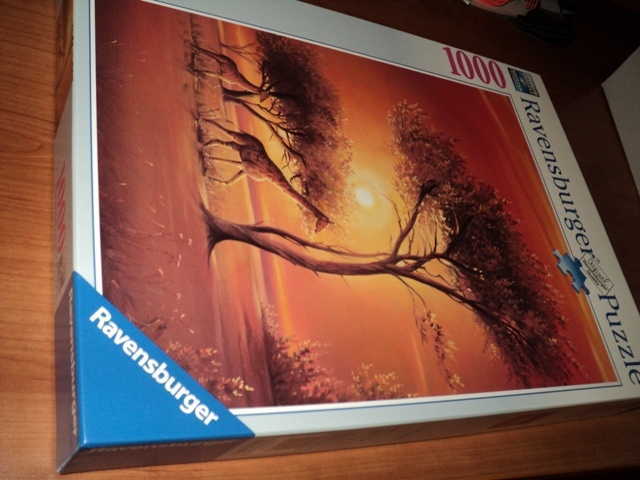 Lastly, take a look at this video of assembling a 5000 pieces puzzle. A word of warning: the end may come as a shock to you.